A Quilter Awakens: What Is Going ON? I give up. What Is Going ON? I give up. Karmen, in answer to your question, I did piece mine on machine. My problem is not pinning on bias fabric. I'm always in a big hurry for gratification. I have about 3 rugs in the works and wanted to get this months block out of the way so I didn't have to worry about getting behind. My blocks are 1.00 a month and 37.50 at the end for something sashing or what ever. 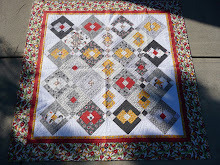 So I won't have much in it and might be able to have it quilted . I love Tula Pink's fabric I've looked at her on the net. Don't give up you will master it.